Read this if you will be traveling on Election Day—or pass on the information to a friend. Election Day 2016 (both for the Presidential race and some Congressional seats) will take place in the U.S. on Tuesday, November 8, 2016. U.S. citizens realize that this might be one of the most important elections in history because the policy platforms, values and personalities of the two major party candidates are such polar opposites. On Election Day, we’ll be home voting in Chappaqua, New York. However, to make it easier for those who are away, technology, travel and government websites have set up special website pages with information for travelers who will be out-of-town on Election Day. Google has launched a new search feature to help voters secure absentee ballots or vote early. After you choose your state, you will find identification requirements, where to vote (based on the home address you enter), and time deadlines for submitting absentee ballots. It also displays your sample ballot. At USA.gov/absentee-voting, you can find similar voting information, more detailed but not as easy-to-follow. Another page on the site, USA.gov/register-to-vote, explains how to check whether you are actually registered to vote at home: by phone, chat, or email. Remember, even if you are at home, it’s vitally important to find out where to vote. To remind travel professionals and their clients of their civic responsibility, Expedia, Inc. brands, (which include Expedia.com, Hotels.com, Orbitz, CheapTickets, Egencia, Travelocity and Hotwire) have also set up a designated website with helpful information for voters presented in an approachable format. According to Department of Transportation data, on any given day, approximately 1.95 million Americans take flight. If a sizable percentage of that number of people fails to vote because they are traveling, that can swing the election in one direction or the other. In the 2000 Presidential election, fewer than 500,000 votes separated the candidates. 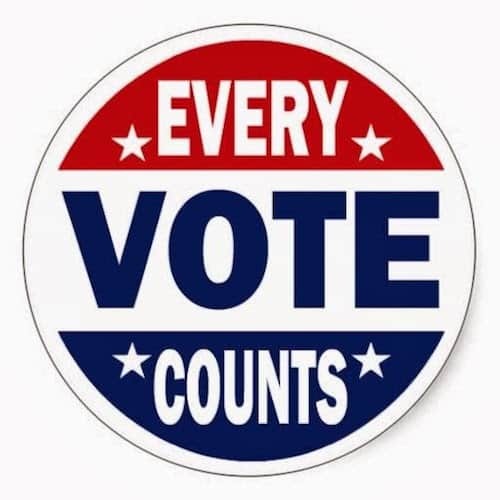 Remember that even if you are traveling on Election Day, every vote counts! Hope you’ll spread the word. It’s so important to vote!